Est. 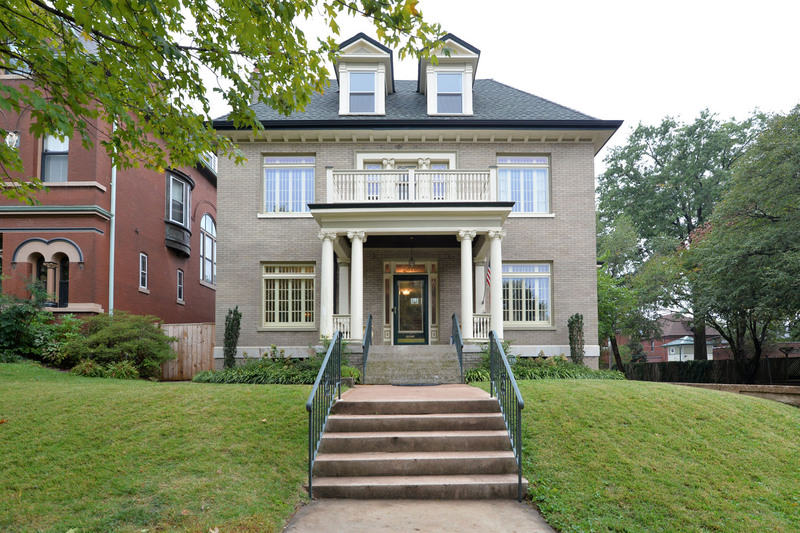 1907: Stunning 3-story traditional Georgian home on tree-lined Flora Place in Shaw. Historically restored with 5 bedrooms, 4.5 baths, & over 4,400 square feet of living space featuring hardwood floors, pocket doors, and period charm. Beamed ceiling in dining room + beautiful period windows, and built-ins. UPDATED KITCHEN with double oven, stainless appliances, and plenty of cabinet space. Sunroom, OFFICE, mud room, and full bath complete 1st floor. Sunlit stained glass stairway leads to 2nd floor hosting the MASTER SUITE with walk-in closet, custom shower, and Jefferson door balcony overlooking Flora Park. Finishing this level is a large bedroom with double closet, renovated bath with wet room, and FAMILY ROOM + BALCONY. The 3rd floor offers three more bedrooms, a full bath with a jet tub, and laundry. Professionally landscaped yard is loaded with fireplace, waterfall, NEW COMPOSITE DECK, paver patio, sandbox, & butterfly/vegetable gardens. This truly grand, yet comfortable & well-cared for home is completed by an insulated/heated 2 CAR GARAGE/man cave.